We provide special attention while catering our Wedding Services to clients. All the planning is carried out by our skilled professionals, who take care of wedding invitations, ambiance of the place, design, theme and other things. 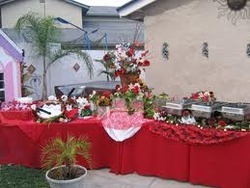 We can also personalize the event as per the requirements of clients. Sai Lakshmi Event Management Pvt Ltd takes the pleasure of offering an extensive variety of unique, inventive and sophisticated event solutions for corporate and private clients. We take immaculate attention in ensuring excellence of service that we offer throughout the designing and planning process and the delivery of events which often exceed our client's expectation which is notably one of the reasons why our customers return to us again and again. One of our biggest assets is client satisfaction that has gone beyond want they want from us.